Modi and Obama meet on Nails! India is waiting for January 26, 2015 to celebrate the Republic Day and witness the WOW moment of US President Mr. Barack Obama’s upcoming visit to New Delhi to attend the Republic Day Parade as the Chief Guest, a first for a US leader. Obama will be witnessing the award ceremony and March-Past on Rajpath. From nuclear to women power, from Namami Gange to 3D tactical radars and from Pradhan Mantri Jan Dhan Yojna to showcasing India as a construction hub, the Capital will offer a glimpse of Prime Minister Mr. Narendra Modi’s vision for the country’s future and its rich cultural heritage on Rajpath. Prime Minister Mr. Narendra Modi will host a private dinner for US President Barack Obama at his 7, RCR residence — his first since taking charge. We hope this friendly meet of two powerful leaders will give way to remarkable developments in the economies of both the countries. 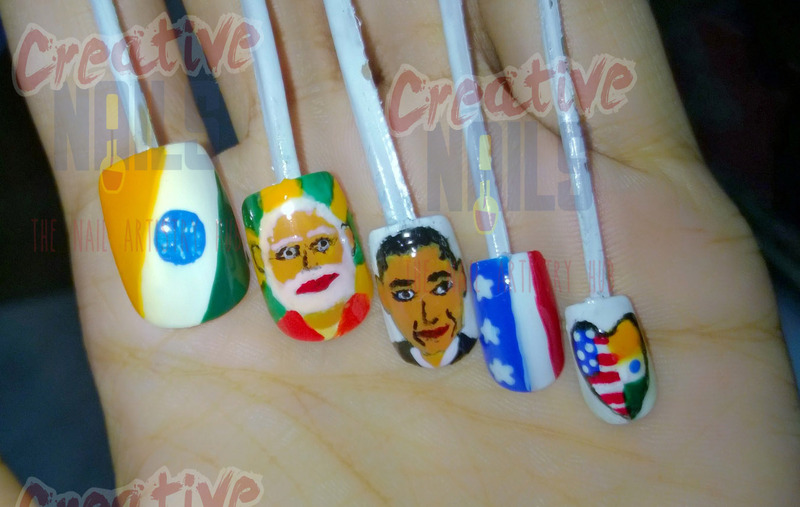 With this hope, Creative Nails is dedicating today’s nail art to the two dignitaries of India and the US, Mr. Narendra Modi and Mr. Barack Obama respectively. ← Republic Day Nail Art!